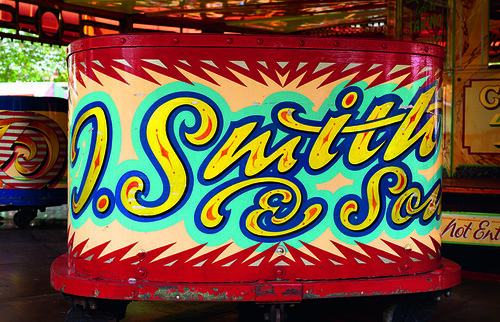 The name Fred Fowle may not be widely known in design circles, but ask anyone with more than a passing interest in English fairground art and the following two words will no doubt pass their lips: ‘The Master.’ Fowle was the country’s foremost fairground artist. Once you become familiar with it, his exuberant, three-dimensional style is instantly recognisable. Fowle’s other less-grandiose nickname was ‘Futuristic Fred’, given to him by the staff at his first employer, the fairground manufacturer R. J. Lakin & Co. The moniker was in reference to Fowle’s striking, futuristic looking three-dimensional lettering and images influenced by popular culture – particularly the cinema posters, adverts and American comic books which he loved. Fowle joined the Streatham-based firm in 1929 – it was here that he learned his trade and where he met the talented artist Edwin Hall, who became a huge influence on him. At the start of the Second World War, Fowle was laid off, and after a spell on the railways and serving in the army, he established the company Hall & Fowle with Edwin’s brother Billy Hall in a disused tram shed in Balham. It proved to be a winning combination, with Hall specialising in painting realistic scenes and classical imagery, and Fowle excelling in the traditional scrollwork, lettering and more abstract designs. Lightning Skid built by Hayes for Tom Smith & Sons in 1965 and decorated by Hall & Fowle. Now owned by Carters Steam Fair. 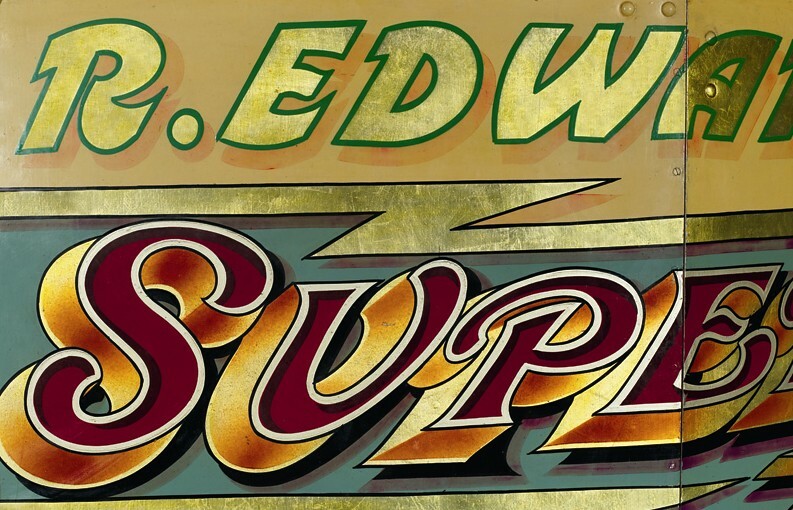 Top: detail from R. Edwards & Sons’ Super Sonic Skid, housed at Dingles in Devon. All photography by John Bodkin. Hall & Fowle’s designs were highly sought after, with the showmen who commissioned them often proving to be extremely demanding clients. The seasonal nature of the industry meant that the bulk of the work had to be carried out in the winter months and Fowle worked long hours. It was during this time that he established and refined his signature style, which featured expressive swirls and curvaceous, freehand letterforms. His relentlessly high standards meant that he insisted on using the best quality paints, and applying no less than twelve coats. Hall stepped down in 1964, and the business became F. G. Fowle Ltd. In the late 1960s, psychedelia entered mainstream pop culture, and this coincided with fairground rides becoming faster and more exciting. Fowle’s work directly reflected both of these developments – iconography such as a winged Mercury and a leaping tiger were used to depict speed and danger, and his designs became increasingly more elaborate and adventurous. His colours became brighter and more intense, he used aluminium leaf (which was often painted over with colour) and he began to experiment with Glitterite, a type of metallic sequin. Designs were initially sketched out on paper, then pricked out and transferred onto the surfaces using a pounce bag containing blue powder and whitening. Fowle had a long brush and a very steady hand. While his technical skills were second to none, it was his imagination and desire to continually push his work forward that really singled him out from his peers. Fowle’s lettering also became more elaborate, with shimmering 3D forms, picked out in black outlines that were applied in one sweep. 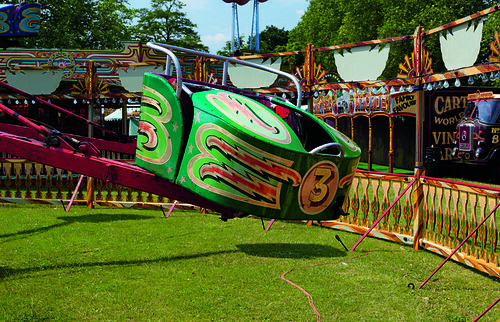 Giant Octopus at Carters Steam Fair, July 2013. Built by Hayes Fabrication of Warwick in 1961 for Tom Smith & Sons and decorated by Hall & Fowle, 1962-64. It was restored to its original Fowle design by Bobby Ayres and its current owner Seth Carter. 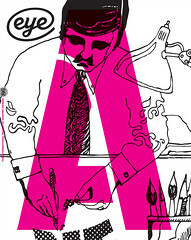 Despite his obvious talent and standing within the fairground community, Fowle remained resolutely self-effacing and modest, insisting that, ‘I think the main thing is to please your customer.’ While his work was probably seen by millions, he was not generally known outside the fairground community. He did however have a number of celebrity admirers, including the world middleweight boxing champion Terry Downes (for whom he decorated an MG sports car in a psychedelic design) and The Who’s Roger Daltrey, who hired him to restore a vintage merry-go-round. In 1983, two weeks prior to his retirement, aged 69, Fowle died suddenly in the stands at Craven Cottage while supporting his beloved soccer club Fulham FC. Heartbroken, his wife burned all of his paper patterns, thus ensuring that no-one could ever recreate his artworks. Fairground art often suffers from its ephemeral nature. Unless the ride itself is retired, it tends to get repeatedly painted over with new designs over the years. Many of Fowle’s remaining pieces have been sold to collectors, although there are some well preserved examples on display at Dingles Fairground Heritage Centre in Devon. The National Fairground Archive (housed at Sheffield Hallam University) contains a wealth of archive material about fairground culture, including many photographs of Fowle’s designs. Detail of one of the cars on the Giant Octopus at Carters Steam Fair, 2013. The most extensive survey of Fowle’s work in print can be found in the covetable 1981 book Fairground Art by Geoff Weedon and Richard Ward (White Mouse Editions), the first edition of which was housed in a slipcase featuring one of Fowle’s elaborate designs. While Fowle’s work has seen the inside of many auction rooms since featuring in the 1977 ‘Fairground Art’ exhibition at London’s Whitechapel Gallery, it has not been shown in a gallery space. Perhaps the current fascination with hand-drawn type and English folk art (displayed by artists such as Jeremy Deller and Alan Kane), will pave the way for a timely reappraisal of Fowle’s work. 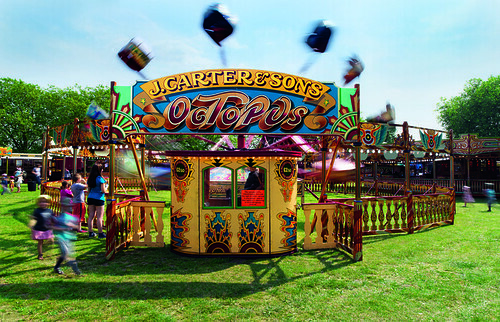 Although examples of his work in situ are now few and far between, Fowle’s designs can still be spotted on the Skid, the Octopus, and the Hook-a-Duck hoopla at the ever-popular Carters Steam Fair. One thing’s for sure, 30 years on and glinting in the late afternoon South London sunshine, Futuristic Fred’s work looks as thrilling as ever. 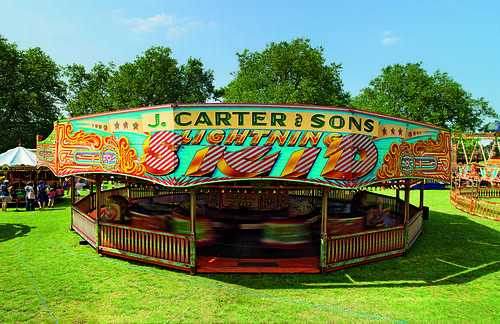 Lightning Skid at Carters Steam Fair, 2013. Built by Hayes Fabrication of Warwick in 1965 for Tom Smith & Sons, and decorated by Hall & Fowle. The Skid was purchased by Gerry Cottle for his vintage fair and is now owned by Carters. 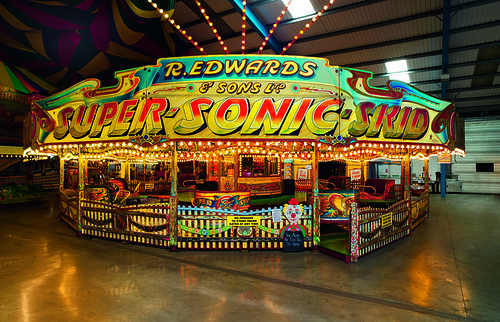 R. Edwards & Sons’ Super Sonic Skid. Built by Robert Lakin of Streatham in 1937 for Hill Brothers of Bristol, Robert Edwards bought the Skid during the Second World War. Decorated by Hall & Fowle in the early 1960s, the ride was restored by Dingles. All photographs by John Bodkin, DawkinsColour. 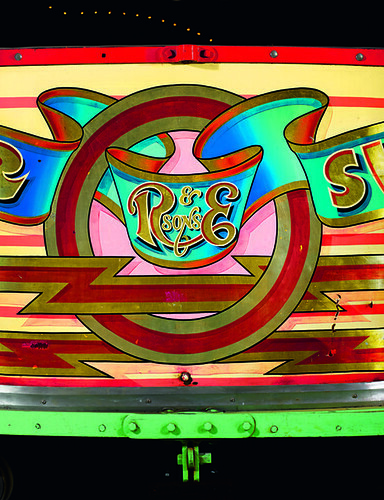 Detail of R. Edwards & Sons’ Super Sonic Skid, housed at the Dingles Fairground Heritage Centre, Devon.